Chanteur Pop et Country US né le 24 Janvier 1941 à Brooklyn (New York). En 1966 et 1967: il connaît le succès avec Solitary Man (repris par Johnny Cash en 2000) Cherry, Cherry, Girl, You'll Be a Woman Soon, (repris par Urge Overkill B.O. du film Pulp Fiction), Kentucky Woman (repris par Deep Purple) et avec I'm a Believer écrite pour The Monkees ( B.O. du film Shrek) ou enfin Red Red Wine (repris par UB40). 1968 : il signe en quatre ans pour MCA de nombreux tubes : Sweet Caroline, Holly Holy, Cracklin' Rosie, I Am...I'Said, Song Sung Blue, Play Me, titres repris entre autres par Elvis Presley, Frank Sinatra, Johnny Mathis, U2, Serge Lama ou Joe Dassin. 1972 : Double album, Hot August Night reprenant ses titres les plus marquants dans des versions live. En parallèle au disque, il s’impose sur scène comme un showman efficace. 1973 : Columbia Records, sa nouvelle maison de disques (avec laquelle il signe le plus important contrat discographique jamais conclu à cette époque) réalise la B.O du film Jonathan Livingston Seagull dont Neil Diamond est l’auteur-compositeur-interprète et qui lui permettra d’obtenir un nouveau succès mondial ainsi qu’un Grammy Award. 1976 : le album concept Beautiful Noise est réalisé par Robbie Robertson. Neil Diamond repart en tournée aux États-Unis mais aussi en Europe et Australie. Dès lors, il entreprendra des tournées mondiales tous les deux ou trois ans. Il participe au concert filmé The Last Waltz. De 1977 à 1982 : Neil Diamond dirige sa carrière vers les casinos de Las Vegas (où il se produit pour la première fois en 1976). Son répertoire s’enrichit de collaborations avec Gilbert Bécaud, Burt Bacharach, Richard Bennett, David Foster, Michel Legrand, Carole Bayer Sager ou encore Stevie Wonder. Ses disques rencontrent toujours le même succès grâce à des titres tels que Désirée, You don’t bring me flowers en duo avec Barbra Streisand, Hearthlight, Forever in blue jeans, September morn (d'abord C'est en septembre avec Gilbert Bécaud) et particulièrement avec Love on the rocks , America et Hello again, trois chansons extraites de la B.O du film The Jazz Singer (sorti en 1980) dans lequel il joue le rôle principal. Ce film n’obtiendra pas le succès attendu, pourtant l’album du même nom se placera au top des meilleures ventes aux États-Unis et dans le monde. De 1983 à 2000 : il enchaîne les disques (tous, au moins disque d'or) les tournées et les shows télévisés. Il sort l'album Tennessee Moon (1996) réalisé avec des vedettes de la country. Pendant cette période, ses disques se vendent moins, pourtant ses concerts attirent de plus en plus de spectateurs. De 2001 à 2009 : En 2005, la critique est unanime pour louer son nouvel album 12 Songs réalisé par le producteur Rick Rubin. Ce disque acoustique est considéré comme sa meilleure production depuis les années 1970. En 2008 : son album Home Before Dark se place no 1 du billboard Américain et no 1 en Grande-Bretagne. Ce nouvel opus est suivi par une tournée mondiale de mai 2008 à janvier 2009. Sortie en juillet du DVD Neil Diamond - The Thank You Australia Concert 1976'. En août sort le DVD et double CD Hot august night/ NYC enregistré live au Madison Square Garden en 2008 lors de sa dernière tournée. En 2010 à 2012 : En novembre 2010 sortie d'un album de reprises Dreams et tournée dans plusieurs pays de mars à juillet 2011. Le 14 Mars 2011, il est reçu par Paul Simon au Rock and Roll Hall of Fame. Le 6 Décembre 2011, sortie d'un Best of, annonce de deux concerts en Février 2012 à Hawaii, et d'une tournée nord-américaine de juin à septembre 2012. En 2012, il a vendu plus de 125 millions de disques. 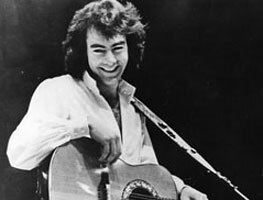 In a career that began in the 1960s, Neil Diamond became a major recording artist, an internationally successful touring act, and a songwriter whose compositions produced hits for himself and others. His earliest recognition, in fact, came as a songwriter associated with the Brill Building era of Tin Pan Alley in the early '60s. But he soon branched out into recording and performing, and by the early '70s was topping the charts with the self-written singles "Cracklin' Rosie" and "Song Sung Blue." This enabled him to be one of the more noticeable figures in the singer/songwriter movement of the period, as he made a transition to more of an album artist and those albums began to earn gold and platinum certifications. He also developed into a dynamic concert performer, as demonstrated on his 1972 album Hot August Night. At the same time, however, his music became generally softer, which broadened his appeal while earning him opprobrium, when he was considered at all, by the rock critics who dominated pop music journalism. But his millions of fans didn't care about that, and they flocked to his shows and bought his albums in big numbers until well into the 1980s. After that, while his concert tours continued to post high grosses, his record sales became more modest. Still, as of 2001, he claimed worldwide record sales of 115 million copies, and as of 2002 he was ranked third, behind only Elton John and Barbra Streisand, on the list of the most successful adult contemporary artists in the history of the Billboard chart. Meanwhile, having been inducted into the Songwriters Hall of Fame and given its lifetime achievement award, he could cite an amazingly broad range of pop, rock, R&B, folk, country, jazz, reggae, punk, heavy metal, alternative, easy listening, and new age performers who had recorded his songs, among them Altered Images, Gene Ammons, Chet Atkins, Michael Ball, Shirley Bassey, Les Baxter, Harry Belafonte, Acker Bilk, the Box Tops, the Brothers Four, Glen Campbell, Vikki Carr, Johnny Cash, Petula Clark, Ray Conniff, Floyd Cramer, Michael Crawford, Bobby Darin, the Spencer Davis Group, Joey Dee & the Starliters, Deep Purple, the Drifters, David Essex, Percy Faith, José Feliciano, Ferrante & Teicher, the Four Tops, Dizzy Gillespie, Bobby Goldsboro, Marcia Griffiths, the Heptones, Engelbert Humperdinck, Julio Iglesias, Chris Isaak, Millie Jackson, Wanda Jackson, Jay & the Americans, Waylon Jennings, Tom Jones, Bert Kaempfert, André Kostelanetz, Patti LaBelle, David Lanz, James Last, Peggy Lee, Liberace, Enoch Light, Mark Lindsay, Lulu, Arthur Lyman, Mantovani, Johnny Mathis, Ronnie Milsap, the Monkees, the Music Machine, Wayne Newton, Jane Olivor, Roy Orbison, Johnny Paycheck, Elvis Presley, Boots Randolph, Cliff Richard, Billy Joe Royal, Frank Sinatra, Smash Mouth, the Specials, Barbra Streisand, Third World, B.J. Thomas, Tin Huey, Tina Turner, UB40, Gary Puckett & the Union Gap, Urge Overkill, Billy Vaughn, the Ventures, Bobby Vinton, Junior Walker & the All-Stars, Scott Walker, Roger Whittaker, Andy Williams, Bobby Womack, and Robert Wyatt. On his own, Diamond continued trying to break into the music business as a songwriter. In 1962, he briefly had a deal at Sunbeam Music, which published some of his songs, followed by a stint at Roosevelt Music. While he was there, an assignment came in from Dot Records to submit a follow-up to Pat Boone's novelty hit "Speedy Gonzales." Ten of the firm's writers eventually collaborated on a song, appropriately called "Ten Lonely Guys," which Boone recorded, and which reached number 45 in the Billboard Hot 100 in October 1962. 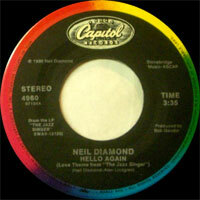 Diamond, one of the ten, was credited under the pseudonym Mark Lewis, but this was his first appearance in the charts. (He also sang lead on the demo, and it has been suggested that the Diamond Records single of "Ten Lonely Guys," credited to Ten Broken Hearts, features his Vocalss. In 1993, he placed a new recording of the song on his album Up on the Roof: Songs from the Brill Building.) Also in 1962, his composition "Santa Santa" was recorded by the Rocky Fellers and released by Scepter Records. But his next career development involved his own performing. In early 1963, he was signed to a singles deal by Columbia Records, and on January 24th, his 22nd birthday, had his first solo recording session, followed by a second session three months later. The results emerged on July 2 as Columbia single 42809, "Clown Town"/"At Night," his first solo release. (Both tracks appeared on In My Lifetime.) Unfortunately, the record flopped, and he was dropped by the label. After nearly two years of hit recording and songwriting, Diamond had a falling-out with his producers and his record label. As popular music turned more serious in the late '60s, he became less satisfied writing simple pop songs, and, instead of "Kentucky Woman," he had proposed that his sixth Bang single be "Shilo," an introspective ballad not about the Civil War battle, but about an imaginary childhood friend, that he had written and recorded. Bang, thinking the song less commercial than "Kentucky Woman," used it as an LP track on Just for You instead, and Diamond, who was also dissatisfied with his royalties, found a loophole in his contract, which, it turned out, failed to bind him exclusively to WEB IV and Tallyrand. He therefore declared himself free to sign a recording contract with another company. Soon, lawsuits were flying. 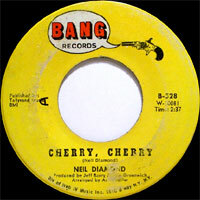 Meanwhile, Bang was reduced to issuing a cover of Gary "U.S." Bonds' "New Orleans," previously released on The Feel of Neil Diamond, as its next Diamond single in December 1967; the disc peaked at number 51 in February 1968. In March, the label followed with a moody ballad called "Red Red Wine" culled from Just for You. It peaked at a disappointing number 62 in April, but the song has had considerable life since. It was quickly taken up by Jimmy James & the Vagabonds, whose cover was a Top 40 U.K. hit later in 1968. The following year, Jamaican artist Tony Tribe also had a British chart entry with it. Vic Dana gave it another run on the U.S. pop charts in 1970, and Roy Drusky reached the country Top 20 with it in 1971. In 1983, UB40, preparing their Labour of Love album of reggae covers, recorded a version based on the Tony Tribe treatment, unaware it had been written by Diamond. Released as a single, this recording hit number one in the U.K., earning a Top 40 placing in the U.S. in early 1984. Then, in 1988, the song was re-released after being revived by a disc jockey and topped the American charts. 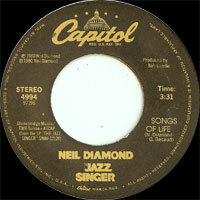 On March 12, 1968, a judge denied WEB IV's request for a temporary injunction preventing Diamond from signing to another record label while his contract dispute was making their way through the courts. It was a key decision; the lawsuits would continue for another nine years until Diamond settled them on February 18, 1977, when he purchased his Bang master recordings. But on March 18, 1968, he signed a five-year contract with Uni Records, a division of the MCA entertainment company. 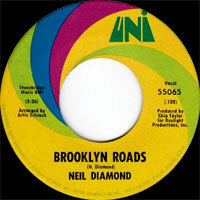 The first product of the deal was another introspective, autobiographical ballad, "Brooklyn Roads," released in April. Forced to compete with "Red Red Wine," released only four weeks earlier, it peaked at number 58 in June. Diamond followed with the more up-tempo "Two-Bit Manchild" that month, but neither that single nor its follow-up, "Sunday Sun," which appeared in September, restored him to the Top 40. It didn't help that Bang chose the same month to release "Shilo" as a single at last. The disc did not chart, and neither did Diamond's debut album for Uni, Velvet Gloves and Spit, released in November. Meanwhile, there was more upheaval in his life. Now romantically involved with TV production assistant Marcia Kay Murphey, he left his wife and moved to California. He would be divorced on November 25, 1969, and, on December 5, 1969, marry Murphey, with whom he had two sons. This marriage, too, ended in divorce in 1996. Professionally, Diamond tried to stem the tide of his career decline by recording at American Sound Studio in Memphis, beginning on January 8, 1969. Working with producers Tommy Cogbill and Chips Moman, he took more of a gospel-tinged, country-rock approach, starting with the single "Brother Love's Travelling Salvation Show," quickly released as a single, which peaked at number 22 in April, his best chart showing in 18 months. (The song didn't attract many cover versions, although Peggy Lee put it on her Is That All There Is? album later in the year. But it became very familiar to Diamond fans as his traditional concert closer.) He quickly returned to Memphis and cut an album also called Brother Love's Travelling Salvation Show that was released in April and peaked at number 82. Among the album's songs was "And the Grass Won't Pay No Mind," which Elvis Presley cut for his From Memphis to Vegas/From Vegas to Memphis LP later in 1969, after which Mark Lindsay recorded it for a single that reached number 44 in 1970. But the song that sealed Diamond's commercial comeback was his next single, "Sweet Caroline (Good Times Never Seemed So Good)," a catchy tune that peaked at number four in August, the same month it earned a gold record certification for sales of one million singles. (Starting in February 1971, Uni added the track to issues of Brother Love's Travelling Salvation Show, which eventually earned its own gold record certification for sales of 500,000 LPs.) It also became Diamond's first single to place on Billboard's Easy Listening (later Adult Contemporary or AC) chart, where it peaked at number three. Eventually, it earned a platinum record certification for sales of two million singles. (The song was widely covered by other artists. In 1970, Anthony Armstrong took it into the Top 40 of the country charts. In 1972, Bobby Womack took it into the Top 20 of the R&B charts. And it has appeared on chart albums by Andy Williams, Bobby Goldsboro, Elvis Presley, the Ventures, Ray Conniff, Boots Randolph, Frank Sinatra, and Waylon Jennings.) Diamond followed "Sweet Caroline" with the gospel-tinged "Holly Holy," released in October 1969, and scored another big hit, the track peaking at number six in December. It was his second gold (and eventually platinum) single, and the song earned a cover by Junior Walker & the All-Stars that made the R&B Top 40 in 1971. The Diamond recording was included in his fifth LP, Touching You Touching Me, released in November 1969; the disc was his most successful so far, peaking at number 30 and going gold in a little over a year. Reportedly, Diamond worked months on the lyric of his next single, the autobiographical "I Am...I Said," released in March 1971. An impassioned statement of emotional turmoil, the song was very much in tune with the confessional singer/songwriter movement of the time, and it became a major hit, peaking at number four in May, with even its B-side, "Done Too Soon" (previously released on Tap Root Manuscript), earning a chart placing. "I Am...I Said" earned Diamond his first Grammy nomination, for Best Pop Vocals Performance, Male. (Personal as the song may have seemed, Bill Phillips covered it for a country chart entry in 1972.) Diamond did not have another new release for seven months, although Bang once again presented one of its overdubbed efforts when it released an altered version of "I'm a Believer" in May and saw it reach number 51. Finally, Diamond returned to the record racks in the fall with the ballad "Stones," released in October, followed by an album of the same name in November. The single reached number 14, while the LP stopped just short of the Top Ten and went gold in two months. Diamond's next album, Moods, was prefaced by another of his standards. "Song Sung Blue," released in April 1972, became his second number one hit on the Hot 100 in July, also becoming his fourth gold single and earning Grammy nominations for Record of the Year and Song of the Year. As a song, it was covered by many artists, quickly recorded on chart albums by Vikki Carr, Ray Conniff, Percy Faith, Johnny Mathis (the LP itself called Song Sung Blue), Wayne Newton, Bobby Vinton, Andy Williams, Cal Smith, and Frank Sinatra. Moods, which followed in June, peaked at number five in September, a new high for Diamond, and went gold in two months. (It later went platinum.) Its success, which included a Grammy nomination for Album of the Year, was augmented by the subsequent release of the singles "Play Me" (number 11 in October) and "Walk on Water" (number 17 in December). In August, Diamond performed ten shows at the Greek Theatre in Los Angeles, recording them for a live album. The double-LP set Hot August Night, which appeared in November, cemented his status as a concert attraction by hitting number five and going gold in a month. (It was later certified double platinum.) 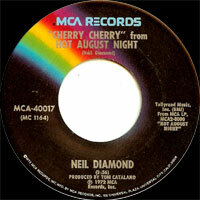 A single of "Cherry, Cherry" was excerpted from the release and made number 31. Hot August Night marked Diamond's ascension to superstar status, and it also marked the end of a phase of his career. After three weeks of shows at the Winter Garden on Broadway in October, he temporarily retired from live performing. At the same time, he had completed his recording contract, and he signed a new, lucrative one with Columbia Records. His first project for the new label was a song score for the film version of the best-selling novel Jonathan Livingston Seagull. It was a troubled project, and by the time the movie was released in October 1973, both Diamond and Richard Bach, the book's author, were suing the film producer. Reviews were awful, and the picture bombed. But Diamond's score, released as a solo album by him, was a hit. The single "Be" only grazed the Top 40, yet the LP reached number two in December, having gone gold upon release. (It has since gone double platinum.) It also won Diamond the 1973 Grammy Award for Best Album of Original Score Written for a Motion Picture or TV Special. "Skybird," the second single drawn from the LP, made the charts and was covered by Dawn for another chart single in 1975. Another year went by before Diamond finally returned to live work, doing a few shakedown shows in California and Utah in late January and early February 1976 before launching a tour of Australia and New Zealand, followed by more dates in the U.S. in the spring. Meanwhile, working with Malibu, CA, neighbor Robbie Robertson of the Band as his producer, he had finished a new album, Beautiful Noise, its songs reflecting back on his early-'60s days in Tin Pan Alley. Leadoff single "If You Know What I Mean," issued in June, reached number 11 on the Hot 100 and number one on the AC chart. The album, which followed a couple of weeks later, hit number four, as usual going gold on release, with one of the newly introduced platinum certifications following in September. Follow-up singles "Don't Think … Feel" and "Beautiful Noise" went Top Ten AC. On July 1, 1976, for a hefty fee, Diamond made his Las Vegas debut at the Aladdin Hotel, though he would avoid the entertainment mecca afterward until well into the 1990s. In September, he returned to the Greek Theatre in Los Angeles, this time with both cameras and recording equipment in tow. On November 25, 1976, he appeared as one of the special guests at the Band's farewell concert at Winterland in San Francisco, performing the Beautiful Noise track "Dry Your Eyes," which he had co-written with Robertson. The show was filmed and recorded for the 1978 movie and triple-LP set The Last Waltz. Diamond picked a good time to reach a career peak: His record contract was up for renewal, and he re-signed to Columbia Records in October 1981 committing himself to ten more albums at a guarantee of 30 million dollars. It was, briefly, the most lucrative record contract in history. At the same time, of course, he had a new Columbia album ready, On the Way to the Sky, advanced by the single "Yesterday's Songs," which topped the AC chart and reached number 11 in the pop chart. The album, however, became his first in ten years to miss the Top Ten, peaking at number 17. The title track, co-written with Carole Bayer Sager, failed to chart as a 45, but a third single, "Be Mine Tonight," made the Top 40. Having worked with Bayer Sager, Diamond now turned to collaborating with both her and her then-husband, Burt Bacharach, a fellow graduate of the Brill Building era, on his next album, Heartlight. The title song, written by the three and inspired by the recently released movie E.T. : The Extra-Terrestrial, emerged in August 1982 as a single that hit number one in the AC chart and returned Diamond to the pop Top Ten, peaking at number five in November. That helped the album to a number nine peak the same month, and by the end of the year it had become his eighth consecutive new album to be certified platinum. Second single "I'm Alive" (co-written by Diamond and writer/producer David Foster) reached the Top 40, and a third single, "Front Page Story" (another Bacharach/Bayer Sager/Diamond composition), also charted. Diamond was relatively inactive on the performing front in 1983, though he did undertake a week-long series of shows at the Forum in Los Angeles in June, his first L.A. shows in six years. He was, of course, writing, again collaborating with Bacharach and Bayer Sager, and recording, and on February 6, 1984, he submitted a new album to Columbia. The label asked him to make changes and, citing the artistic control mandated in his contract, he sued to have the LP released as it was. In April, however, he withdrew his suit and revised the disc to the record company's requirements. After completing the new version, he accepted a 500,000-dollar fee for performing three shows at Harrah's Trump Plaza in Atlantic City, NJ, in June, then undertook a European tour, followed by an American tour. Columbia released the new album, Primitive, in July, along with the first single, "Turn Around" (co-written by Diamond, Bacharach, and Bayer Sager). Notwithstanding the label's attempt to enhance the commerciality of the disc, it was a disappointing seller. "Turn Around" lodged in the AC Top Ten, but missed the pop Top 40, and Primitive peaked at number 35 and only went gold, the worst showing for a new Neil Diamond album since 1969. Two follow-up singles only made the lower reaches of the AC chart. Diamond reacted by working up what was intended to be one of his most personal albums, as indicated by its proposed title, The Story of My Life. He submitted the collection to Columbia in September 1985, and for the second time in a row had an album rejected by the label. This time, he did not protest publicly. Instead, he accepted Columbia's suggestions that he try to take a more contemporary approach by, for example, working with Maurice White of Earth, Wind & Fire, recording a song written by currently popular rocker Bryan Adams, and using such guest stars as Stevie Wonder (who also co-wrote a song). Eventually, every song on the album except the former title track, "The Story of My Life," was replaced. To further promote the upcoming release, now titled Headed for the Future, in January 1986 Diamond taped a new television special, Hello Again, for CBS, then the parent company of Columbia Records. The special was broadcast May 25, two and a half weeks after the release of Headed for the Future, which itself had been prefaced by the release of the title song (written by Diamond, Hensley, and Lindgren) as a single in late April. The effort to modernize Diamond succeeded only slightly. The album peaked at number 20, an improvement over Primitive, but like its predecessor, the album only went gold. The single missed the Top 40, and a second single, "The Story of My Life," got to only number 11 AC. Diamond's main collaborator for his next studio album, The Best Years of Our Lives, was David Foster, who produced it and co-wrote several of the tracks. Released in December 1988 to coincide with an HBO special, the album peaked at number 46 and went gold, with three of its tracks making the AC chart. Much the same response greeted Diamond's next studio album, Lovescape, produced by Peter Asher (the famed producer of James Taylor and Linda Ronstadt, who began to work with Diamond regularly), when it appeared in August 1991. It peaked at number 44 and spawned three AC chart entries, while taking almost three years to go gold. Meanwhile, however, Diamond remained a major force on the concert circuit, taking his Love in the Round tour around the country and around the world. In 1992, for example, he was said to be the second-highest grossing American concert act of the year. Given this continuing appeal, he and Columbia hit upon a new strategy for his record releases. For the time being, they suspended the usual practice of having him simply write and record a new studio album every year or two. Instead, they embarked on a series of special releases that focused on his status as a veteran singer. The Greatest Hits (1966-1992), released in June 1992, was a double CD spanning the Bang era and the Columbia hits, with the Uni material represented by recent live recordings; by 2000, it had gone triple platinum. In September 1992, Diamond released his first seasonal collection, The Christmas Album, and promoted it with Neil Diamond's Christmas Special on HBO. The album peaked at number eight in December, his first Top Ten LP in ten years. Within a year, it was platinum, with another million registered by 2001. During 1995, Diamond finally got to work on an album of newly written material, but there was a twist. The man whose songs had sometimes been turned into country hits went to Nashville and held songwriting sessions with country writers, also recording with country stars. The result was Tennessee Moon, released in February 1996, along with a TV special, Under a Tennessee Moon, broadcast on ABC. The album peaked at number three in the country charts and number 14 in the pop charts and went gold. Next, Columbia released In My Lifetime, a three-CD box set retrospective, in October 1996, including Bang, Uni, and Columbia hits, along with demos and other rarities and unreleased material. The album charted, a relative rarity for box sets, and went gold. Diamond continued to make events out of his album releases. In October 1998, he issued The Movie Album: As Time Goes By, a two-disc collection of covers of movie songs like "Moon River" and "Unchained Melody." It reached number 31 and went gold, earning a Grammy nomination for Best Traditional Pop Vocals Performance. As usual, Diamond embarked on a world tour to support it. And as usual, his fans came out. Even during a decade when he retreated from the frontline of recording artists, the singer's live following, if anything, increased. He was named the top solo concert artist of the 1990s by Amusement Business magazine. Diamond's appeal to audiences was reflected humorously in the film Saving Silverman, featuring a self-spoofing appearance by the singer, which opened in February 2001. More seriously, he finally wrote and recorded a new studio album, Three Chord Opera, released in July 2001. In fact, he did all the writing entirely by himself, the first time he hadn't collaborated with anyone since Serenade in 1974, which gave Columbia a promotional tag to bill the album as another "event" release. Considered as his first regular studio album since Lovescape in 1991, the disc was Diamond's highest-charting release of this sort since Heartlight in 1982, peaking at number 15 and quickly going gold. 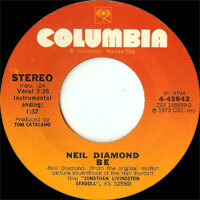 In December 2001, Columbia's Legacy division released The Essential Neil Diamond, a new two-CD retrospective, and by 2005 it was a platinum seller. The fall of 2003 brought a massive five-CD/one-DVD set, Stages: Performances 1970-2002, which sold well enough to spend a couple of weeks in the chart as Diamond undertook yet another lengthy tour. In 2004, he began working with renowned producer Rick Rubin, a longtime fan who had produced Johnny Cash's 1990s comeback albums, including American III: Solitary Man. Before releasing the result of their collaboration, the 2005 album 12 Songs, he embarked on another world tour. 12 Songs was issued on November 8, 2005, to a chorus of positive reviews. It entered the chart at number four, Diamond's highest chart placing in 25 years, but its longer-term success was short-circuited because of Columbia's decision to include anti-copying software on the CDs. The software was thought to damage personal computers, and many of the discs had to be recalled, hurting Diamond's sales, although the album was certified gold. In 2006, Diamond made another movie cameo, singing "Hava Nagilah" in the film comedy Keeping Up with the Steins, and he returned the recording studio with producer Rick Rubin for 2008's Home Before Dark. Released May 6, 2008, Home Before Dark entered the Billboard chart at number one for the week ending May 24, 2008, Diamond's first-ever chart-topping album. A holiday release, A Cherry Cherry Christmas, appeared in 2009. In 2010 Diamond released Dreams, a covers collection featuring songs by some of his favorite songwriters of the rock and soul era. In 2011, he was inducted into the Rock and Roll Hall of Fame. 1972 SP MCA MCA-40092 (US) . 1998 CD COLUMBIA 41636 (US) .